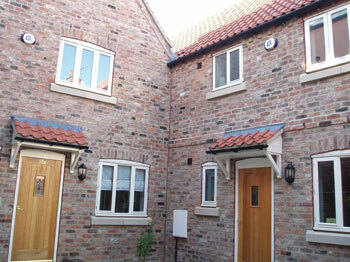 These two cottages were built by York Conservation Trust in 2006 on waste land at the rear of 15-17 Walmgate (properties also owned by the Trust). They are both of two bedrooms each and were built in reclaimed bricks. The land on which they are situated was once known as Britannia Yard, part of the Britannia Inn which was situated where 17 Walmgate is now. It was first mentioned in 1818 and again in 1820 when it had changed its name to Britannia Coffee House. In the 19th century Walmgate was one of the worst disease ridden slums in the city. The area had become increasingly overcrowded and unhealthy when hundreds of Irish families immigrated to York, after the devastating Irish potato famine which took place between the years 1846 and 1851. It is recorded that sixteen cottages in Britannia Yard housed fifteen Irish families and one English family; in total there were over one hundred and seventy one Irish people in this one yard. The architect, Richard Parkin, and the Trust won the York Design Award for New Build in 2007 for the construction of these cottages. Unfortunately, for security reasons, it is not possible to view them close at hand.